If you're looking for a simpler alternative to Quicken without a subscription, then Moneyspire is an excellent option. It's not as complete or advanced as Quicken but it's much cheaper and easier to use. 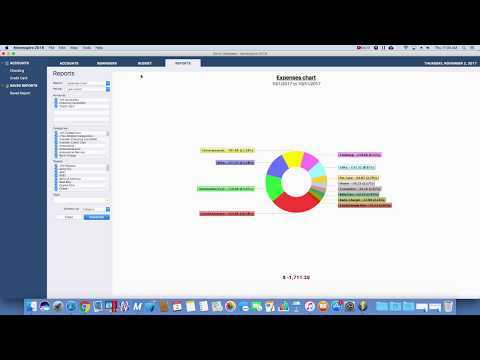 Moneyspire is a well-organized and effective personal finance application for Mac and PC. If you’re looking for a desktop alternative to Quicken for Mac, it’s an excellent choice. Even better, you can currently get 40% off Moneyspire for Mac for a limited period. Unlike Quicken, Moneyspire doesn’t require any subscription fees. It also doesn’t host any of your financial data in the Cloud – everything is stored on your Mac desktop if you choose. In this review, we take a closer look at what Moneyspire can do and give you our thoughts on it. Since the Moneyspire app is the same on both Mac and PC, this review will be of interest to both Mac and Windows users. If you’re looking for a simple but effective desktop personal finance software for your Mac, then Moneyspire is easily one of the best options out there. It’s desktop based. Moneyspire doesn’t host any of your financial data in the Cloud. You can choose to use Moneyspire Cloud (for free) which syncs data between your Mac and mobile device but this is optional. It’s got both a Mac & PC desktop client. There’s no subscription. Moneyspire is a one of purchase fee of $29.99 which is currently 40% off and very reasonable compared to the competition. It’s very easy to use with no bloated features that you don’t need. The online banking integration comes at no additional cost. There’s no extra cost for using Moneyspire Connect or Direct Connect. Moneyspire allows you to do essential budgeting tasks such as reconciling accounts, manual transaction entries, split transactions, automatic bill payments/reminders etc. Here we take a look at Moneyspire for Mac in more detail. The first thing to look for in any decent personal finance tool is whether it gives you a good overview of your finances. Moneyspire certainly does this with an easy to read, no fuss dashboard. You can link an unlimited number of checking, credit card and loan accounts to Moneyspire and some investment houses too. However, investment account support is limited to certain investment accounts – you can’t link Vanguard accounts for example. If you need decent investment account support, we strongly recommend Personal Capital instead (full review here). Along the top of the Moneyspire dashboard are 4 main tabs with all the essentials – Accounts, Reminders, Budget and Reports. The Accounts view gives you a very good overview of your overall balance and transactions in one place. You can easily search transactions and assets by name, amount, number, payee, memo, category or tags. You can also add useful attachments to transactions in Word format, images and PDF files. This is extremely useful when searching for receipts and guarantees or if you want to go paperless on your Mac at home or in the office. In the Reminders tab, Moneyspire has a useful calendar view to keep on top of bills and makes it clear to see when they’re due. The Budget tab shows you how on target you are for various categories with figures for current rollover, budget target, actual spending and total difference. There’s also a useful Forecast view to help you avoid unexpected overdraft fees and bounced payments. Another thing we appreciate about Moneyspire is the mobile app for iPhone and iPad is free. It’s also pretty good compared to many personal finance apps allowing you to edit transactions on the move, check your budget and view all your checking accounts at once. Overall, Moneyspire is highly customizable including everything from font colors and size to register columns and column order. Multi-currency support so Moneyspire can be used in any country not just the USA. This includes downloading of exchange rates and transferring of money between foreign accounts. Check printing (including payee address) and calibration of check stocks. Read more on other check printing software for Mac here. Many Quicken users have switched to Moneyspire after being disillusioned with Quicken For Mac, especially after it moved to a subscription only model. 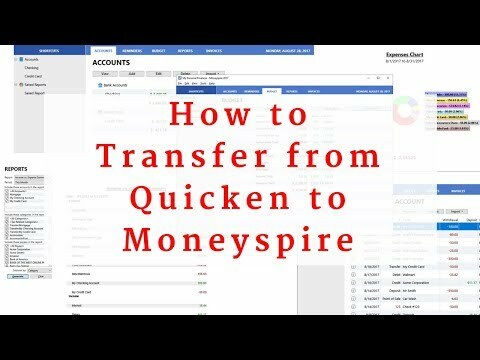 Moneyspire can import Quicken (and Mint files) although as with most personal finance apps that offer this feature, this isn’t without its problems. The issue is that Quicken files are usually complex and inevitably, you’ll find that there are import errors, duplicate transactions and other things that need cleaning up. It really depends on the complexity and extent of your Quicken accounts, whether there are attachments etc. So basically, Moneyspire can import Quicken files although you may have to do a lot of cleaning up. 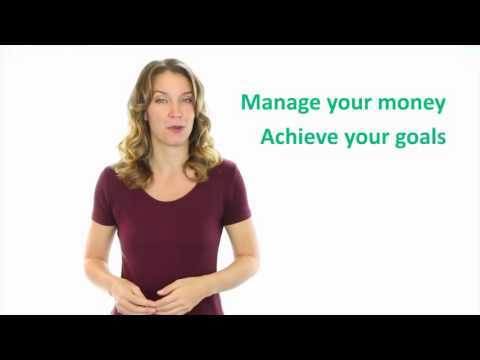 Our advice is to start your accounts from scratch with Moneyspire and keep your Quicken accounts for legacy purposes. The other problem is that since Quicken 2019, the Mac version no longer exports to QIF format. However, the Windows version of Quicken still exports to QIF so Mac users must open their accounts on a PC and export them if they want to import them to another program. Moneyspire offers one of the most generous online banking deals of any personal finance tool on Mac. There’s no extra cost for Moneyspire Connect which allows you to automatically download transactions for 15,000 institutions worldwide. This avoids the painstaking need to manually enter accounts and transactions from your accounts. Moneyspire also works with the standard Direct Connect service offered by most financial institutions which you can use to pay bills. However, note that some banks such as Wells Fargo charge for using Direct Connect so check with your financial institution first. You can also import OFX, QFX, QIF and CSV files or drag and drop files from your bank into Moneyspire. You can export to QIF and CSV which you can import into other financial tools if you choose to switch from Moneyspire at any time. One of the big attractions of Moneyspire is that it doesn’t store your financial data in the Cloud. Everything is kept on your Mac desktop. If you choose to use Moneyspire Connect to sync to the Moneyspire Mac and Mobile apps you have two options, one of which does go through the Cloud. You can either sync through the Cloud based Dropbox service or you can choose to sync manually through your iTunes account (which does not go through the Cloud). Whichever method you choose, all financial data is stored in a single file which is encrypted by military grade 128-bit encryption. You can configure automatic data backup to a customizable location. Moneyspire is currently 40% off at just $29.99 which is excellent value. There are no additional charges for Moneyspire Connect or mobile apps like with many other personal finance apps. Licenses are valid for a lifetime and one license is valid on both Mac and PC. Minor updates are free although major updates are offered at a discount to users. Customer Support is free and available online via email. Most users report that Moneyspire response times are fast and helpful. – Quicken is STILL desktop based ONLY. It does NOT require ANY data to be stored in the cloud. It is still optional and only needed for some online services. – the Quicken mobile and web apps are free but only available if you have a paying subscription. In other words, there are no extra costs to use it. Of course if membership subscription expires, those tools can no longer be used, unlike MoneySpire. I just spent a few weeks using Moneyspire and it’s been extremely disappointing. I spent a great deal of time setting up all of my accounts (bank, credit card, retirement, etc. ), and connecting to them using Moneyspire Connect. I attempted my latest sync with them yesterday and not all transactions are downloaded. That makes this software completely useless if that’s what you want to do. All the time I spent setting it up was completely wasted! None of my balances are correct in the accounts because transactions are missing. I am using large financial institutions, one of the largest banks, one of the largest credit unions, and large retirement institutions. If Moneyspire can’t work with them I don’t see how they have a viable product. I can’t even get it to connect to my credit union anymore. When I try to refresh the connection I get an error message and when I try to sync my credit union accounts the CU texts me a security code but there is no where to enter it. The Moneyspire Connect service is free and you get what you pay for. Save yourself a lot of time and aggravation and avoid Moneyspire. Thanks for sharing your experiences John and sorry to hear about all the problems you’re having. Have you tried using Direct Connect instead? It seems that all bank sync services provided by personal finance apps have problems, including big ones like Quicken. Often this is due to ever changing security procedures on the bank side which make it harder for third party applications like Moneyspire to access them. That said it sounds like you’ve had some major problems and you should contact Moneyspire support (support@moneyspire.com) and they may be able to explain the problem. How is MoneySpire’s option to sync via iTunes account not syncing via the cloud… is it a local sync only and not via the iTunes ONLINE account? Also, this suggests that this option is only available to iPhone users, since iTunes does not run on Android phones. That’s right the Moneyspire iOS app syncs via WiFi so it’s not Cloud syncing. There is no Moneyspire Android app yet although on the website it says “coming soon” so eventually there will be one too. I have wasted an incredible amount of time on Moneyspire adding all of my accounts and setting them up using Moneyspire Connect to download transactions, and then trying again and again to get it to work correctly. You now expect me to reset them all up using Direct Connect in the hope that might work? You’re kidding, right?